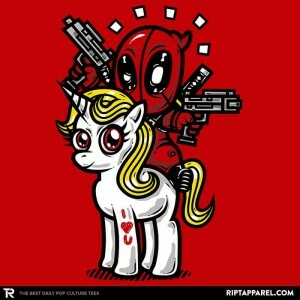 Okay, sure, you love Deadpool and you love unicorns, but did you ever think you were ever going to get a shirt that would combine your two loves? Well, I guess it’s not that unlikely of a possibility given Deadpool’s penchant for quirkiness. I mean, hell, he’s called the Merc with a Mouth and you can’t even see his mouth, not to mention a good portion of his dialog is internal. All I know is that if there’s just one thing Deadpool loves it’s Mexican food. And after that it’s unicorns.